Residence apartment for sale in Ovacik with swim-up and penthouse apartments available. 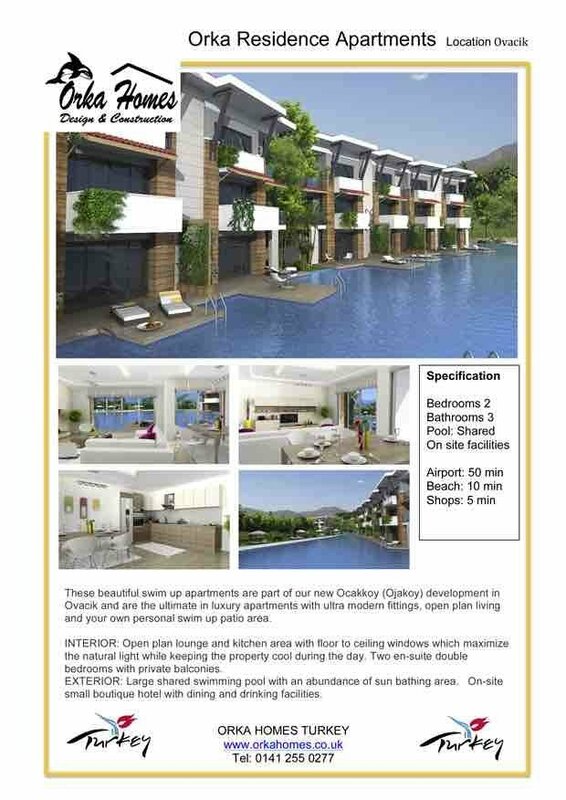 These 2 bedroom apartments are very spacious with the choice of a lower ground floor swim-up apartments or an Upper Penthouse model. Each apartment has terraces overlooking the swimming pool. Each luxury apartment has two double bedrooms a large open plan living area incorperating a well laid out kitchen and dining area. There is also a downstairs W/C and the apartment s are filly air conditioned. This is a gated development with access to our new Orka Ocakkoy Boutique Hotel with spa and gymnasium facilities, restaurant, bars etc. The hotel will have excellent onsite facilities as you would expect rom an upmarket complex. There will be 24 hour security gated entrance and a host of other onsite facilities. On this exclusive site there will only be 20 apartments and 15 luxury villas.